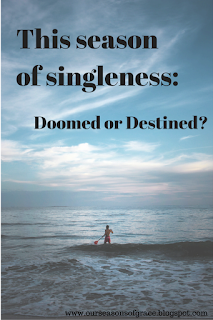 Our Seasons Of Grace: This Season of Singleness: Doomed or Destined? I grew up with the expectation that I would be married by my early twenties. I expected I would be able to have as many children as I decided (which changed from 2-6 multiple times!). It did not occur to me that I might be single for an undetermined time. The people that I knew who were single past their twenties were few and far between. In my mind, eventually they would get married. Enter my late teens. Despite what I knew of God’s standards for Christian relationships, I turned away from, ‘do not be unequally yoked with unbelievers’ (2 Corinthians 6:14). I thought I knew better. 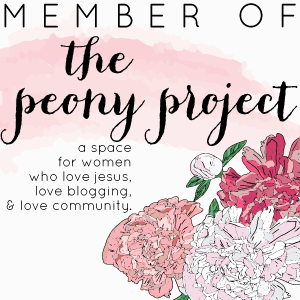 I thought that being with someone, even a non-Christian, was better than being single. I have now spent the last 3 years single. 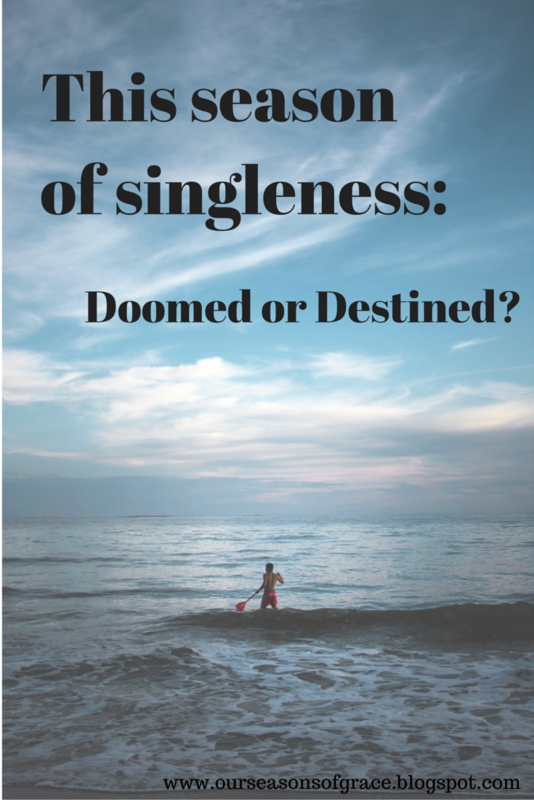 There have been plenty of times that I have believed I am doomed for singleness. One is not a very pretty number most of the time. The lonely night when going through a tough time isn’t fun. The lack of a partner to share your hopes, dreams and fears with isn’t fun. The unfulfilled desire of marriage and children is not fun. For a long time, I did not think there was much that was fun about being single. 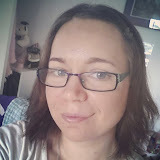 For a long time, I did not understand how people coped with being single. Even when I believed I’ve been doomed to singleness, God has continued to work to change my heart towards this season of my life. There are times it feels like winter. Sometimes it feels like it will be winter forever. But there have been amazing days of spring as well. Though I have made poor choices in the past, I feel like God’s grace is evident. God has been gracious to heal my body, soul and mind from a destructive cycle. God has shown grace to reveal who He is, over and over, so that I may fall in love with Him as my heavenly Father again. God has given grace to open up doors in loving families at church. Does this make me doomed? I do not think so even though I will still have days I will think I am. As I have begun to embrace this season, I have seen opportunities arise. They may not replace the desire of my heart. But I feel like God has been gracious enough to open these doors and allow me to experience joy from serving Him and others.